Documents provided to the Maryland Drivers Alliance show that The Town of Morningside deployed speed cameras on a road maintained by Prince George's County without having received authorization from the county, and despite the county's explicit denial of permission for the town to do so. 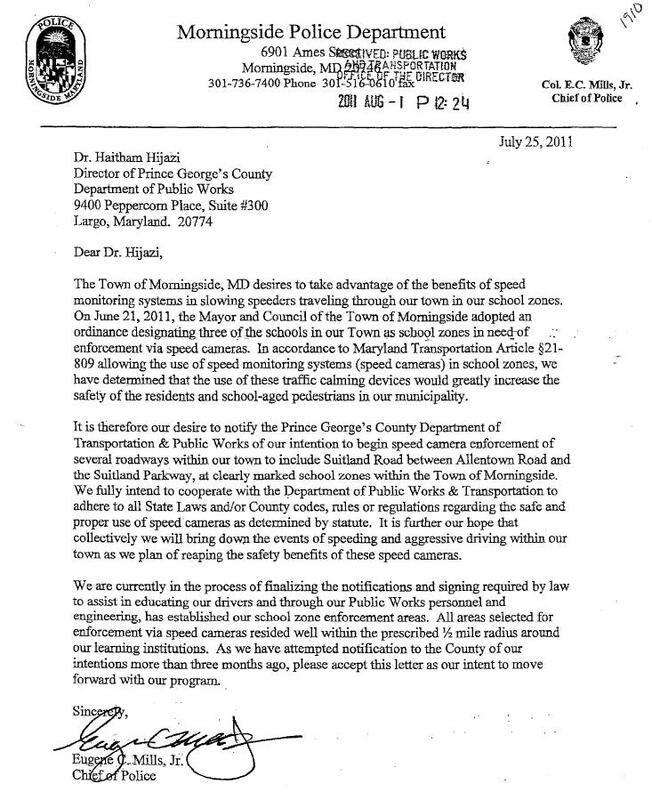 The town wrote Prince George's County a letter on July 25, stating that they had created new school zones for the purpose of deploying speed cameras, including in locations on county roads, and that they were "notifying" the county of their intent to deploy the cameras on county roads. 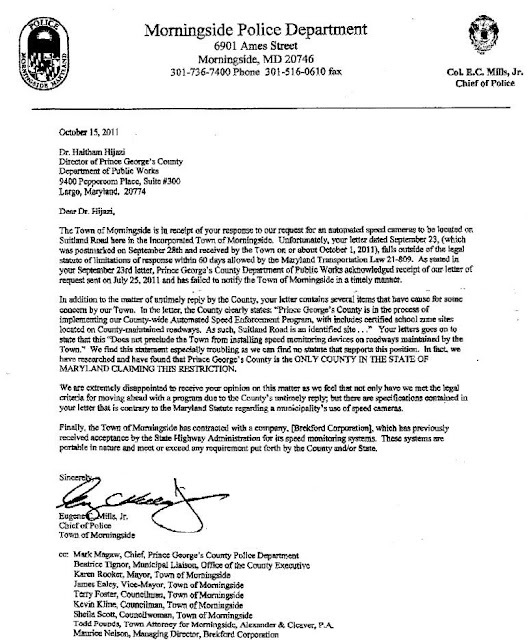 "I am in receipt of your July 25, 2011 letter in which you requested permission to install speed monitoring devices on Suitland Road between Allentown Road and Suitland Parkway." 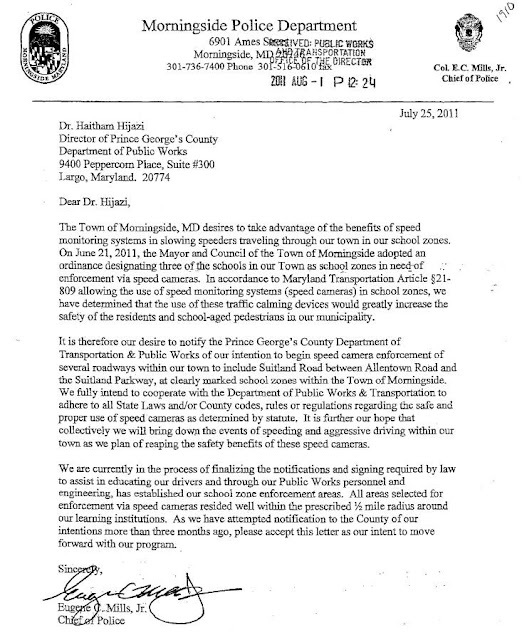 wrote Dr Haitham Hijaz, Director of Prince George's County DPWT "We certainly applaud the Town of Morningside's concern for pedestrian and bicycle safety; however permission to install the speed monitoring devices along this roadway cannot be approved. Prince George's County is in the process of implementing our County-wide Automated Speed Enforcement Program, which includes certified school zones sites located on County-maintained arterial and collector roadways. 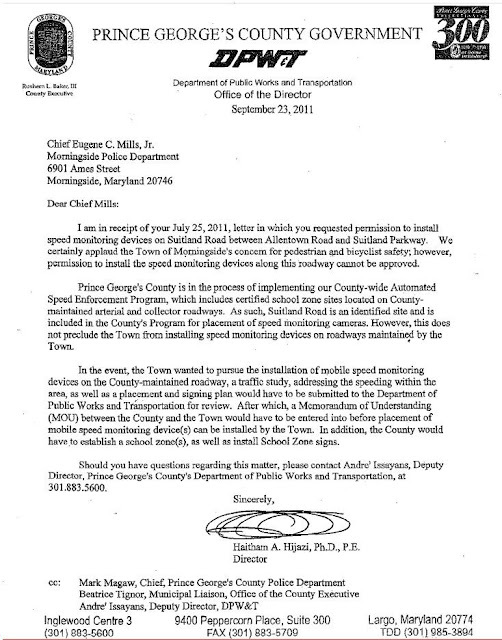 As such, Suitland Road is an identified site and is included in the County's Program for placement of speed monitoring systems. " The county then went on to describe the requirements which the town should follow, such as performing a traffic study, if it nevertheless wished to try to obtain a permit to deploy cameras on a county road. Morningside currently deploys speed cameras on Suitland road, a county road, despite never having received any formal authorization from the town. It is unclear whether the town even has authority to designate a school zone on a county road which does not directly border the school, or to place the required signs without the county DPWT's consent. If cameras are deployed by the county, rather than by a town government, then all revenues would go to the county treasury rather than the municipality. In 2010 the legislature wrote a specific provision into the law establishing a procedure by which Prince George's County, and only Prince George's County, would determine whether the county or the municipality had jurisdiction to deploy cameras in a particular location. 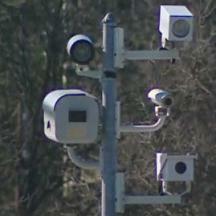 The Maryland Drivers Alliance has been closely examining the town's speed camera program after they failed to respond to a Maryland Public Information Act request for speed camera calibration records within the 30 day time period required by state law. When the town eventually responded, they denied the request for calibration records.